Borgani Joe Lovano Pearl Silver Tenor Saxophone Excellent Condition 19626 – Sounds like a Conn! Borgani Joe Lovano model in Pearl Silver with 24k gold plated keywork. This has not been played much since it was bought new last year by the original owner. It plays like a vintage Conn but with modern keywork, which is pretty cool. More like a New Wonder II than like a 10M. The tone is big, dark, wide, and pretty spread. You can find videos of Joe Lovano playing this model, if you search on Youtube. If you love the sound of a Conn, but you don’t want to play a horn with vintage keywork, this is really your only option among modern saxophones. This horn has no dents, no dings, no past repairs at all. It has been well cared for and feels quite good under the fingers. It just got the pads checked out, and it is playing very easily. It comes in the beautiful original case which is also in great shape. 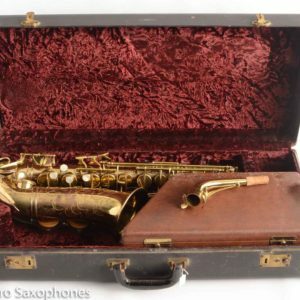 This basically pristine vintage saxophone from 1951 is the same as the Buescher Big B, just with less elaborate engraving.. These professional quality saxophones are known for their good intonation, sweet and mellow tone, and excellent build quality. This particular example is from the very beginning of the model run just after the end of the Big B model, and is in nearly mint condition. It still has its original pads (and Snap-on resonators), and even plays a bit on them, but you will want to get an overhaul. These play very well when set up- just listen to Johnny Hodges play his Big B to get an idea of what you can sound like on this horn with an overhaul, 50 years of practicing, and a knee-buckling load of raw talent. Also, as an added bonus (“at no additional charge!”) this horn comes with a wooden clarinet in the case of unknown potential labeled “Revelle Master”. This is a 1949 Buescher “Big B” Aristocrat, so named for the ornate engraving of a, well, a Big B on the bell. This horn is in very good condition, and the typical wear around the fine engraving of the B on the bell is not present, which indicates that this horn has led a life mostly in a closet somewhere. There are no resolders or past dentwork to speak of, and it plays *way* better than it should on some very old pads, but you would want to get this repadded to play like it can, which is very, very good! These horns are undervalued in my opinion. I mean, you can get this one in such great shape with all of its original Snap-on resonators and overhaul it for not a whole lot more than a new Yamaha student model in total- seems like a good buy to me! Johnny Hodges famously played one of these, and his tone is a very good example of the blend of sweetness and power these horns possess. Beautiful original lacquer, original pads Buescher Super 400 alto ‘Top Hat & Cane’ model. 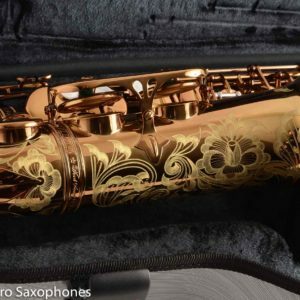 This is the most deluxe saxophone that Buescher produced, with deluxe engraving, fast keywork, and Buescher’s signature top quality intonation. Don’t miss the little details that take these horns from good to great, like the silver “tone ring” under the bell lip, the underslung octave key, and the raised Buescher logo in the engraving. If you have been looking for an alto that has the sweet, dynamic, moderately-focused Buescher tone, and that looks beautiful, and is in uncommonly good original condition, look no further. This alto has no resolders, no dents, and only light play wear on the original lacquer. It has the original case in good condition. The neck is in very good condition. Even on the original pads, this alto still plays surprisingly well. It has the snaps and spuds intact, as well as the gold plated Norton springs. Everything you look for in a top quality Buescher is here. Just get the pads replaced by the repair shop of your choice, and you will have an alto that sounds bigger, sweeter, and more complex than any of the modern alto options, that tunes excellently, and that looks gorgeous. These are built extremely well, and they stay in adjustment very well down the road. The Buescher Top Hat and Cane altos are the creme de la creme of Buescher altos, and they are quite hard to find in this sort of condition. Only one available, and priced quite low to sell quickly. I also have the matching tenor, already overhauled, if you are interested in a matched set. Full description coming, but this is a beautiful Conn 6M VIII alto with great original lacquer. This is pre-war, original pads, needs a good overhaul, but besides that, man, this is the one you want. This pre-war (from the American perspective, meaning prior to the government order than restricted the manufacture of musical instruments along with anything else made out of brass) Conn 6M was built in 1941, and is the desirable “VIII” version, with the VIII stamp on both the body and neck. It is in very good physical condition with original lacquer, no dents, and no major or minor past repairs or resolders, with the exception of a repaired dent on the bowguard, which is visible in the photos. It has what appears to be a recent repad, or perhaps an old repad that wasn’t played much after it was done, and Conn Res-o-pads were used. It plays well with a big voice, and although to my professionally-obligated-to-be-picky tastes it is not quite as astoundingly slick under the fingers at these feel when they have been overhauled as the best repairers can do, it is definitely playable as-is and will beat the pants off of most any challenger, especially modern imports that cost a lot more and give you a lot less than this fine example of vintage American saxophone craftsmanship. Oddly, the lacquer on the neck is more worn than the rest of the horn- although physically the neck is in immaculate condition with no dents or past pulldowns. In the past when I have seen this the culprit is usually a homemade neck bag that was lacquer-unfriendly, or perhaps the owner had a habit during rests to hold the horn with the neck in his hand. Given the lack of wear elsewhere on the horn, I’d guess a neck bag was the culprit here, although I can’t be certain. But again, though the lacquer itself is mostly gone from the neck (and the neck alone), the neck tube is flawless and there are no signs of past repairs of any kind. The microtuner is free and functional, and all of the original rollers and present and moving freely. The engraving is crisp and clear with no lacquer loss, and the pearls seems largely unworn. The keywork is tight and the body is straight. This is a very clean example of the most desirable vintage of the most desirable variant of the Conn 6M, and it can be yours for less than a new Yamaha YAS-26. You could be forgiven for thinking that because there are two original lacquer, very good condition Conn 28M “Connstellation” saxophones on my website at the moment that these are somewhat common, but I assure you that is not the case! I will copy and paste the general statements about the 28M from the other description, with the unique description of this particular instrument’s physical and playing condition at the bottom. These saxophones were redesigned, utilizing many ideas from Allen Loomis (Conn’s resident saxophone visionary) and Hugh Loney, with input from Santy Runyon, with the aim of creating a saxophone that had extremely slick keywork and a very balanced scale. The keywork, although familiar under the fingers with regard to placement and layout, is mechanically quite different from any other saxophone and has been built from the ground up with the goal of reducing mechanical friction. There are no pivot screws anywhere on this saxophone, instead the long rods have a very long hinge rod with the middle machined down so only the ends touch. The G# has a very unique torsion mechanism to provide a G# feel that is smooth throughout the range. The side keys are designed so that the angle and distance of travel is the same for each key. There are adjustment screws on the upper and lower stacks as well as the left hand pinky table. The bell keys are on the left side, and the pantsguard/bell keyguard is a large acrylic plate that was designed with the idea in mind of allowing the horn to vent properly regardless of playing position or clothing choice. The octave mechanism has three pips (octave vents), one on the neck and two on the body, which has the end result of a very clear middle D and no hiss on the A or G#, as well as excellent intonation. The keywork in general is very light, and the pearls are larger than usual for Conn and a little flatter. The overall feeling is of a very light horn, extremely slick, easy to play, excellent intonation, and very even throughout. The one downfall of this design is the pantsguard, which is fairly brittle and often broken. Although nowadays there are excellent replacements available, this one has its original guard in decent condition. There is one repaired crack (visible in the photos) and the common small cracks radiating from some of the screw holes. I would anticipate, absent any further damage, that this keyguard will last and should not present any problems- although I will furnish you with contact information for obtaining a well made (and somewhat more durable) replacement should you ever need it. And believe it or not, I have experience shipping these so you can rest easy knowing I will remove it for shipping, wrap it separately, and it will arrive to you in good condition. This instrument plays quite decently on what appears to be an older repad with plastic domed resonators, with a strong, moderately bright, cheerful voice. The clarity of the tone is notable, and it is a lot of fun to play with a unique look and feel and timbre that would lend itself easily to classical, big band, or small group jazz. The lacquer is original and in good condition with some playing wear and a few stand scratches near the low C#, with no evidence of past repairs or dents or resolders of any kind. It is also a unique and interesting piece of saxophone history, in very good condition, and whoever owns this instrument next will have a lot of fun being its steward for the next generation. King Soprano Saxophone Original Silver Plate 81960 Great Deal! King altos are the best altos ever. This one has some lacquer wear from use, but it is original lacquer. The saxophone is in great shape, and plays quite well on the current pads. No serious past repairs at all. It is such a great tone that you get from these full pearls Super 20’s. This is the ‘Series II’ which has the best combination of beauty, features, and key work of all of the Super 20 altos. You really can get the Cannonball Adderley vibe going on one of these (with lots of practice) better than almost anything else. Cannonball played almost exactly this serial alto on Kind of Blue. This plus a Meyer 5 plus a soft reed and lots of guts is what you need for what I consider to be the benchmark for good alto sound. The tuning, ergonomics, and build quality on these is really excellent. Tone is warm, powerful, classy, and medium dark. One of the best horns you can get per dollar spent. SML, short for Strasser-Marigaux-LeMaire, is probably the best known small French maker of saxophones. They produced high quality instruments with a unique blend of features that ended up in what I like to think of as a perfect blend of Selmer and Conn- a very French tone, but big like a Conn. The SML “Revision D”, which was not an official name but rather one given by collectors to the model run with this particular set of features, is a professional handcrafted French saxophone whose features include rolled toneholes, a switchable automatic G#/C#, double sprung octave mechanism (which is an excellent feature preventing slow octave changes and should be standard on all saxophones), a 4 slot neck tenon receiver (again, an excellent feature that should be made standard, this time one that applies pressure more evenly around the neck tenon for a more secure fit less likely to develop leaks), and adjustment screws on the upper and lower stacks. In fact, the Revision D is very much like the model that came after called the Gold Medal, and shares the same bore. The only features that the Gold Medal has that this horn doesn’t are the rocking octave thumbrest (which isn’t actually so great and is often times disabled at the request of the player) and the adjustable felt bumpers for the low notes, which while nice is not a game changer in any way. This particular horn is in very good aesthetic shape, and currently wears old pads and will need an overhaul although it does play a little bit as-is. The original silver plating is in very good condition and seems to be almost unworn, and the neck shows no sign of past damage or repair work. There is some evidence of past dentwork around the lower stack F# and G# toneholes, which were both unfortunately filed a bit for levelness at the time the dentwork was done, I am guessing. However the filing does not go through the roll, and should not impact playability or repairability, and the dentwork is not noticeable until you get close. If it weren’t for that, this would be a nearly pristine SML, and this flaw serves mostly to bring down the price without having much of a real-world effect on ownership. These SMLs have a fantastic sound, unique in their blend of refined yet powerful, and possess excellent craftsmanship. Not very many were made- about 15,000 total of all sizes of the horns considered to be their best- and they hold up very well over time. Great deal on one of the best intermediate tenor saxophones on the market. The Yamaha 475 is made in Japan and plays a lot like a YTS-62, but costs less. This tenor has been played a fair amount. The pads are sealing pretty well right now, but it is a mix of older and newer pads. The neck had a dent removed, and it was done well, so it looks good now. If you want a very well-built tenor, that feels good, tunes well, and is easy on the budget, this is it. Don’t waste your money on a new no-name sax. Those will be worth peanuts as soon as they are used. Yamaha horns are quality and hold their value really well. You can basically play it and enjoy it and sell it later for right around what you paid. Hard to beat. Nice condition Yamaha Custom 875 Tenor Saxophone in very good shape. This horn is nice and clean and comes with the original case also in good condition. Great deal for a fully professional Yamaha tenor saxophone that will serve well for any level of playing from a serious beginner player through a full professional career. This horn has a medium dark, rich tone compared to other Yamaha saxophones. It tunes well, and it feels great under the fingers. Good purchase! This is a beautiful, near mint condition Yanagisawa A901B professional alto saxophone in excellent condition. It has original black lacquer with engraving cut through the black into the brass, giving the horn a beautiful two tone look. This horn just got tuned up thoroughly by Matt Stohrer, and it plays extremely well. I like the 901 the best of the modern Yanagisawa saxophones. It has a freer vibrating body tube than the 991, and it has a big, medium bright, open tone that works great for a range of playing settings. You can darken it up with a classical style mouthpiece, or you can brighten it up easily for jazz. Intonation and ergonomics are excellent. This horn is super well-built. Yanagisawa has the best build quality of any modern saxophone, and it will really hold up well over time. Only one available! This is a rare finish, and turns heads. I also have a fancy $1000 gold plated Yanagisawa neck I could throw in for $500, and a solid silver Yanagisawa alto neck I could include for $500 also.